Yes, I know it’s summer and usually the last thing you want to do is turn on the oven, especially when it’s really really hot, but roasted vegetables can be a great way to actually escape of staying too long in the kitchen! Making roasted vegetables is as easy as putting them in the oven! It’s really that simple! Everything happens while they’re in the oven – without a whole lot of work for you! I prefer to roast them instead of boiling! Oven roasting allows root vegetables’ natural sugars to caramelize and makes them extra tasty to enjoy while warm or at room temperature. Roast ‘em. Almost all vegetables can be roasted. Vegetables like carrots, potato, pumpkin, sweet potato, zucchini, bell peppers, eggplant, and onions have a lovely sweet taste when roasted. Many vegetables are good for roasting: turnips, beets, fennel, parsnip, asparagus to add earthy flavour to recipes. 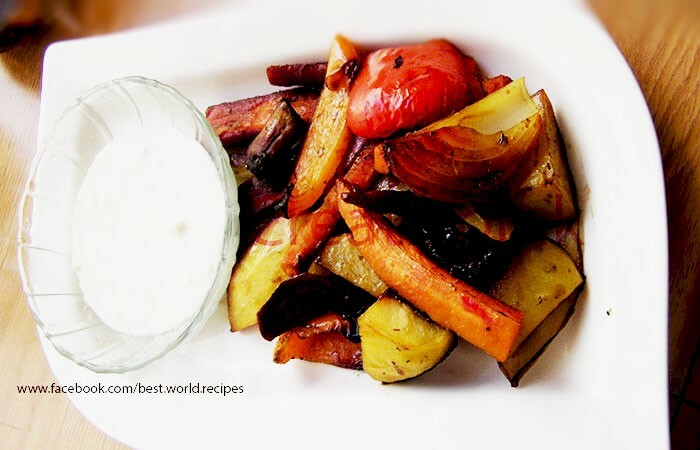 For this recipe I have used: onions, carrots, beets, bell peppers and potatoes. I always make a lot of them as if for a crowd and use leftovers in so many different ways! For example if making roasted pumpkin and by any chance there is something left I am making an amazing pumpkin and onion soup with a touch of sour cream and grilled bread with cheddar cheese! Something to die for! Any other vegetables can be used for salads, sandwiches or omelets. Roasted bell peppers can make any dull rice salad to vibrate! 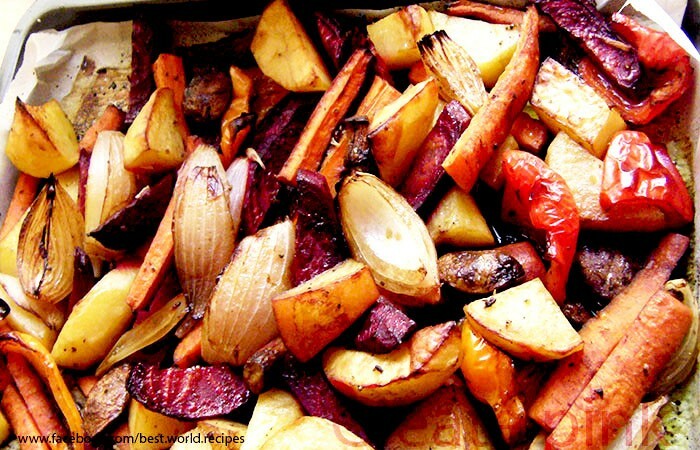 The secret for perfect roasted vegetables: a nice and hot oven to put the vegetables in! While the oven preheats, prep the vegetables. Wash and remove any blemishes, removing skins if appropriate. Then cut the vegetables into pieces roughly the same size. Just remember: the smaller the pieces, the quicker the vegetables will roast. Either in the roasting pan or a large bowl, toss vegetables with a tablespoon or two of olive oil, 1-2 tablespoon of balsamic vinegar and 2 tablespoons of chilli soy sauce. Oil helps the vegetables brown, so don’t skip this step. The vinegar and the soy sauce helps them to caramelize and adds a smoked flavour! You can add coarsely chopped garlic, but you can also use garlic powder which easily gets the garlic flavour all over the veggies in a quick way, dried herbs. I am using only oregano, salt and pepper or other seasoning. Toss them well and then spread the coated veggies onto a baking sheet and bake at 400º for 30 to 40 minutes until they are just tender. About halfway through the roasting time, give the pan a good shake or use a spatula to turn the vegetables to move them around a bit to brown evenly. Remove from oven, arrange on a platter, and serve warm.